last monday i went to a concert with s and dad to see emmylou harris at cirkus here in stockholm. i’d never seen emmylou live before. 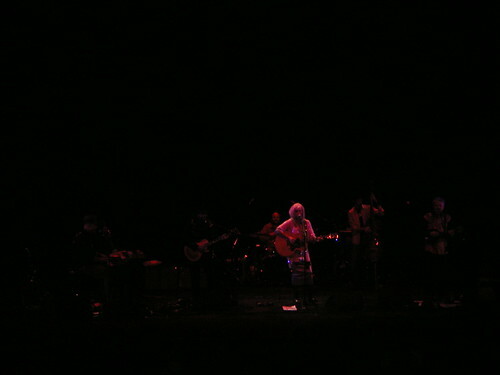 it was a wonderful concert, emmylou is a wonderful singer and musician. and it’s so obvious she loves to sing and play her guitar. i was truly enchanted by her voice. emmylou has released many wonderful albums, her two latest stumble into grace and all i intended to be are frequently played in my home, but the red dirt girl album is still my favourite. her she sings the titel track from that album. sorry about the poor quality, i hope you may appreciate it anyway. this is my favourite song from the red dirt girl album: michaelangelo. oops! sorry, linking from youtube didn’t work, i’ll fix it as soon as i can! autumn has really arrived in stockholm, and tomorrow i’ll take my bike and ride over to skansen for their annual turn-of-century autumn market. i feel like i’m coming down with a cold, but i hope i’ll feel better tomorrow, their autumn market is something i look forward to every year. but i suppose some tea with honey and perhaps a whiskey after dinner will make me feel better! and then crawl into bed with my calvin and hobbes comic books that i just had to look for in the attic this afternoon. EDIT: i just remembered that i don’t care for whiskey, so i’ll have a small cognac instead. a finished object! 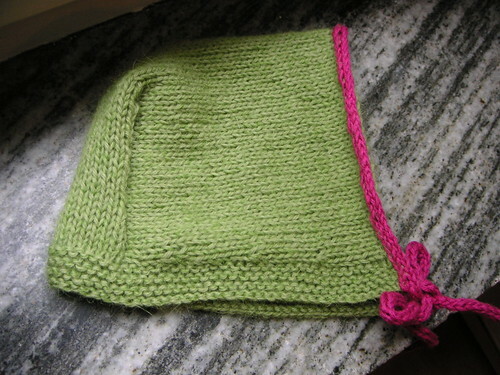 i’d almost forgotten i was capable of finishing my knitting projects, but obviously i can. this supercute little thing was gifted yesterday to a little sweetheart, little miss m. it was a wee bit too big for her, but hopefully i can show you a photo of her wearing it later on. isn’t it great? 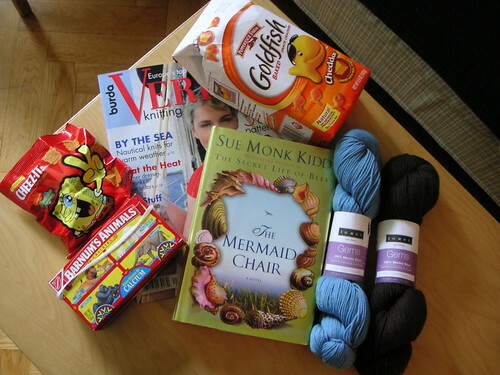 lovely blue and brown louet yarn, cheese crackers, knitting magazine. and a book of course! looking forward to reading it, thanks for the wonderful goodies, marji!